Anybody that has known me for any length of time knows I’ve been a die-hard Lone Wolf fan for some 15 years now, their products are light years ahead of the competition! I’ve always been a huge fan of their hang on treestands and climbing sticks. 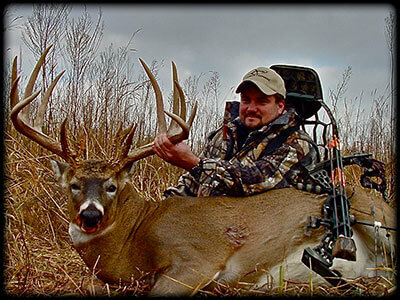 In fact, in 2006 I killed my biggest buck to date (a 208” giant) after doing a hang and hunt with this set up. What’s the big deal? I went into the area at 3pm (stand and sticks on my back) and hung them right on the edge of a 15 acre patch of prairie grass, 2 hours later the biggest buck I’ve ever shot stood up from his bed at 80 yards! Shot him moments later, try to do that with ANY other companies stand and sticks without making ANY noise! You just can’t beat the quality or the quietness of these products! Even though this is my favorite combination, I like a little bigger stand for gun season when I’m more likely to sit all day, that’s why I always pack my Lone Wolf sit and climb stand for my trip to Illinois – not this year. Lone Wolf introduced it’s larger version of the stand this year with a new wider seat and molded cushion and after trying it out, comfortable is an understatement! I just hope I don’t get caught napping when Mr. Big shows up! Honestly, it’s a HUGE improvement to what was already the best climber on the market. Kwik Straps. Available in 2’ and 4’ lengths, these rubber straps are ideal for strapping your climber together or securing the climbing sticks to the hang on stands. They are super easy to adjust and the rubber material they are made of is super quiet and wont slip, it almost glues itself right to the stands and locks them together like no bungee cord I’ve ever used before! All in all, it was definitely worth the short drive out of my way to check out the new products Lone Wolf has available now and I can’t wait to try out my new climber this weekend. For those of you that are interested in getting into filming your hunts or maybe already do, be sure to check out the Lone Wolf Strong Arm. I’ve tried them all and this is my favorite camera arm on market today!